The new report by Zion Market Research on the “Europe Precision Medicine Market — Europe Industry Analysis, Size, Share, Growth, Trends, and Forecast 2016 – 2024" has a vast information about the market and its potential. 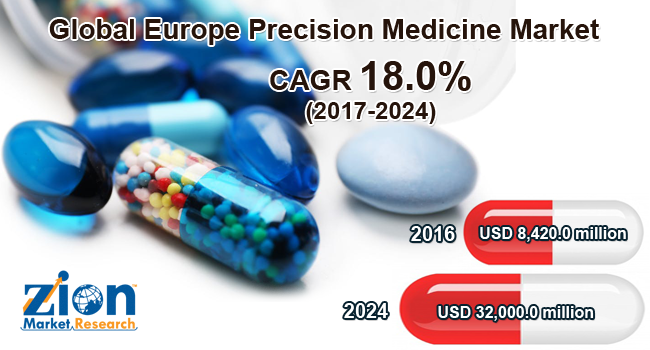 The Europe precision medicine market was valued at around USD 33,200.0 million in the year 2014 and it is expected to reach approximately USD 35,500.0 million by 2024. The Europe precision medicines market is expected to exhibit a CAGR of more than13% between 2017 and 2024. The healthcare institutions in Europe are willing to use genetic testing and analytics technologies, payers willing to reimburse the cost of high-value drugs, drug companies that focus on developing new personalized therapies, companion diagnostics providers that drive improvements in information gathering, and genetic analytics services which help interpret the results. Considering all the above factors the market for precision medicines in Europe will significantly drive the market during the forecast period. There will be an increasing demand for the Europe precision medicine market from the diagnostic tool companies. Also, the rising prevalence of cancer in the region will increase the preferences and tailors therapeutic interventions to the individual molecular features of a patient and/or their disease. The Europe precision medicine market is segmented on the basis of the technology, application, and the geographical regions. The personalized medicines show faster growth in the pharmaceutical industry due to its anticipated transition to more precision medications. Precision medicines contribute for major share by revenue in the pharmaceutical segment and are expected to continue during the forecast period. There are several technologies in precision medicines.Big data analytics have a huge demand in the Europe precision medicine market owing to increased applications in healthcare and healthcare IT.The big data analytics plays a major role in interrogating the patient electronic health record toward to result in improved clinical decision support which will boost the segment in near future. Due to the increase in awareness and high demand for diagnostic tools & instruments for targeted therapies, the diagnostic tool companies are dominating the Europe precision medicine market. Due to a number of applications of precision medicine, its demand in the Europe market is expected increase exponentially. Among the several applications, the major demand is for the market is Oncology and immunology application. As cancer is among the leading causes of death, both nationally and worldwide. The sequencing of individual patient tumors has revolutionized oncology because the genetic information facilitates the elucidation of molecular changes in a specific patient’s cancer. The country that is having an influential share in the Europe Precision Medicine market in Germany. Owing to the wide range of solutions and services being offered in the country is flourishing the market during the forecast period. The major market players in the Europe Precision Medicine market are Roche, QIAGEN N.V., Cepheid, Inc, Johnson & Johnson Services, Inc., Illumina, Almac Group, bioMérieux SA, Intel Corporation, GE Healthcare, Novartis, Thermo Fisher Scientific, among others.